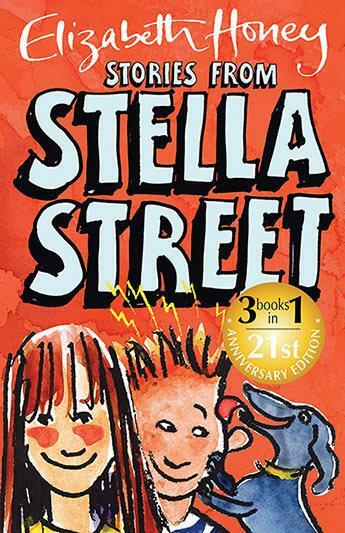 Meet Henni, the tallest girl in school, and her best friend Zev, with amazing electric hair, and Briquette, little Frank’s dog … and everyone else in Stella Street! Read Henni’s original version of what her gang did when the Phonies moved into their street and started to spoil everything! It’s fast and funny and you never know what’s going to happen next. Henni also tells the story of life-changing events when the Stella Street gang all went bush and camped by a wild river, and then how their perfect old-beach-house holiday in Cauldron Bay nearly ended in disaster. Three hair-raising adventures in one chunky book! Elizabeth Honey writes with the invigorating energy of a salty wind off the sea that wakes you up and makes you see the world afresh. Warm-hearted, funny, touching and wise, the Stella Street stories are about growing up and living life to the full.